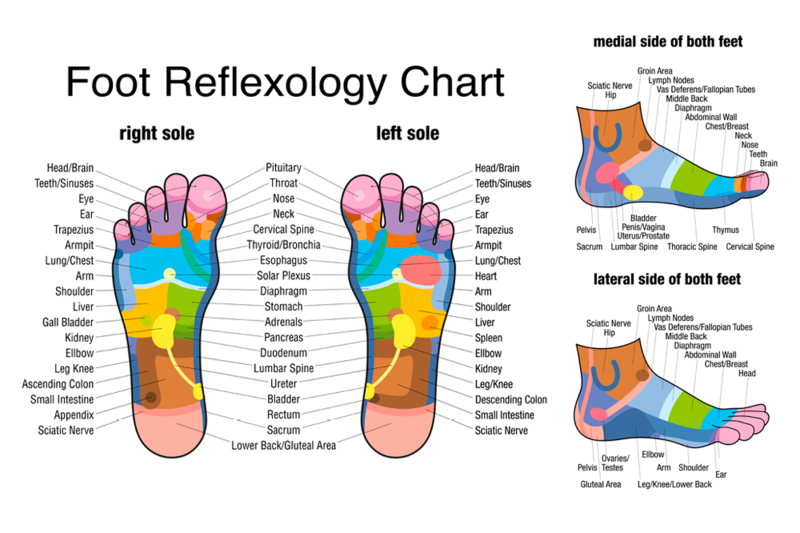 Everything you need to know about foot reflexology, including how to read a reflexology foot chart, how to apply reflexology and how it benefits your body. Imagine you have a pounding headache and all it takes to relieve the pain is pressing a specific point on your foot. Or you have intense menstrual cramps that won’t let up, but pressing a small point on your heel brings almost instant relief. The situations may sound almost too good to be true, but scenarios such as these are commonly practiced and believed to be effective in the world of foot reflexology. But what exactly is reflexology? Read on to learn the history of the ancient medical practice, how you can read a reflexology foot chart on your own, and how reflexology is thought to benefit your body and wellbeing. Reflexology, sometimes called zone therapy, is an alternative medicine therapy that uses a variety of techniques to apply targeted pressure and rubbing on specific points of the body. Reflexologists usually focus on the hands, ears and feet, believing that these areas are directly linked to other parts of the body and can offer a therapeutic effect to organs and other body parts when stimulated. Reflexology is not the same thing as massage, which is rubbing specific muscles to relieve bodily tension. Rather, reflexology stimulates the nervous system and organs to relieve bodily tension. Reflexology has been practiced all over the world for thousands of years, beginning in places like China, India and Egypt. Ear, nose and throat specialist William H. Fitzgerald and Edwin F. Bowers are thought to have been the first to introduce reflexology to the United States in 1913, but most current reflexologists refer to the modified version of the practice created by nurse/physiotherapist Eunice D. Ingham in the 1930s and 1940s. Most modern medical practitioners remain skeptical about reflexology, but some US doctors use it as a form of complimentary medicine in conjunction with traditional medication to treat diseases and conditions like diabetes, cancer, asthma, migraine headaches, menstrual symptoms and organ function. However, as it stands, there is no convincing evidence that reflexology is an effective treatment for any medical condition and therefore is usually excluded from health insurance coverage. Because reflexology is practiced all over the world, there is no central agreement on where specific reflexology points are located on the body, including the feet. However, most reflexologists divide the body into 10 vertical zones — five on each side — that the body’s energy is said to flow. This means that if you want to relieve bodily discomfort on a certain side, you’ll want to choose the corresponding foot. For example, the stomach lies on the left side of the body, therefore, you’d want to apply reflexology on the left foot to experience the largest benefit. Your feet are not mirror images of each other when it comes to which body parts they connect to, though they do share many similarities. The toes are thought to correspond with the head, neck and shoulder area of the body. The tips of the toes are believed to be connected to top of the head, teeth and sinus area. The middle part of the second and third toes are thought to connect to the eyes, while the bottom of the toes (where they merge with the ball of the foot) are thought to be connected to the ears. The glands are said to be connected via the middle of the big toes, while the shoulders are thought to be connected to the outer edge of where the ball of foot area connects with the toes. The ball of the foot is thought to connect with the chest area of the body. The out edge is said to be connected to the lungs, while the central area of the ball of the foot is believed to be connected to the heart. The middle of your sole — where your foot is the most narrow — is believed to be connected to your waistline. The small intestine is said to be connected via the inner part of this area on the foot, while the large intestine is said to be connected via the outside edge as well as in the area just below the ball of the foot. Your heel is believed to be connected to your pelvic area as well as your legs. The sciatic nerve is said to be accessible via the heels during reflexology, as are the knees. The groin area is thought to be connected via the top of the foot, around the ankle area. Your spine is thought to be accessible via the inside edge of your feet (on the big toe side). Reflexologists consider this to be an important area because the spine is considered the main freeway bones, nerves and muscles use to communicate with the brain. Using the stomach example from above, one can surmise that because the stomach is on the left side of the body and between the chest region and waistline region, it makes sense to stimulate the left foot between the chest area and the waistline area (so below the ball of the foot, near the arch area). 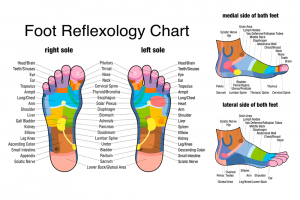 For further details regarding reflexology foot charts, you can check out a detailed toe chart, outside foot chart or an inside foot reflexology chart. Just note that outside and inside foot charts are generally reserved for people with lots of experience with foot reflexology, so you may want to consider taking a foot reflexology class if you’re interested in reading those charts. Reflexologists generally stimulate reflexology points by applying gentle but firm pressure in a clockwise motion on the points for about 20 seconds, followed by gentle but firm pressure in a counter-clockwise direction for about 20 seconds. Sometimes they walk their fingers and thumbs along reflexology points for several minutes or until the patient begins to feel relief. One important thing to note is that reflexology patients should stay well hydrated both during and after reflexology therapy treatment. Though still considered by many modern practitioners as being a suspect therapy, reflexology is growing in popularity as a complimentary form of medicine, especially in Europe and Asia. One example is Denmark, where numerous companies have reportedly been hiring reflexologists for the last two decades. According to the University of Minnesota, several studies have shown that reflexology practices in Denmark have resulted in reduced sick leave and absenteeism for Danish companies, as well as almost one third of employees reporting greater satisfaction with their job after completing six reflexology sessions. RELATED: Can Placing Raw Onions In Your Socks Really Cure Illnesses? Other believed benefits of reflexology include an increase in energy and circulation, decreased stress and fatigue, ultra relaxation, reduced depression, pain relief and regulated sleeping patterns. It is also said to eliminate toxins, stimulate the central nervous system, prevent migraines, clean up urinary tract conditions, speed up recovery after injury or surgery, and assist in the treatment of some cancers.